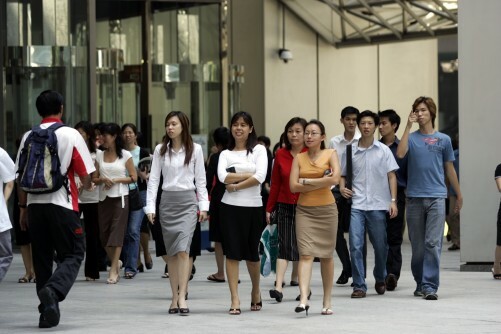 EMPLOYMENT growth slowed and the unemployment rate edged up in the first three months of this year, according to preliminary estimates released yesterday by the Manpower Ministry. Economists said the slowdown might continue, but might not be cause for concern as last year's employment growth was unsustainably high. Acting Manpower Minister Tan Chuan-Jin wants to slow employment growth further. "We are still generating more jobs than we should accommodate," he said at the opening of OCBC Bank's new training campus yesterday. Employment grew by 20,800, down from 44,000 in the last quarter of 2012. Fourth-quarter growth is usually strong. But the latest figure is also the lowest first-quarter gain since the 2009 recession. The year-on-year fall suggests that "the extent of the decrease is more than a seasonal dip", said UniSIM economist Randolph Tan. Instead, weak external demand and economic restructuring were the two reasons economists gave for the latest figures. Services employment grew by 14,600, down from 15,800 a year before. The construction workforce grew by 7,800, down from 8,700. The export-oriented manufacturing even saw a fall in employment. It shed 1,800 workers, the first shrinkage since end-2011. However, total employment in March was still 3.8 per cent higher than a year ago, at 3.38 million. This worried Acting Minister Tan, who said: "We need to bring the average workforce growth rate for this decade down to 1 to 2 per cent per year." Barclays economist Joey Chew said the fall in employment growth was "healthy". She noted that last year's strong hiring, despite weak gross domestic product growth, caused productivity to fall. The first quarter's "overdue correction in hiring pace" suggests that firms are finally restructuring, "rather than hoarding labour and persisting with inefficient practices", she added. Bank of America Merrill Lynch economist Chua Hak Bin described the first-quarter employment growth as "a more sustainable pace". He expects job growth for the full year to maintain this pace, at about 70,000 to 80,000. With weaker job growth, unemployment rose to 1.9 per cent in March, from 1.8 per cent last December. The unemployment rate for residents - citizens and permanent residents - rose to 2.9 per cent from 2.7 per cent previously. Yet citizen unemployment stayed unchanged at 2.9 per cent. Tighter foreign worker policies have had the effect of "tilting the cost advantage" towards local hires, said Dr Tan. UOB economist Alvin Liew said that the policies have pushed firms to focus more on retaining local workers. Despite higher unemployment, fewer workers lost their jobs. An estimated 2,000 workers were laid off in the first quarter, down from 3,350 in the preceding quarter and 2,600 a year ago. Kelly Services Singapore vice-president and country manager Mark Hall said several companies, especially in financial services, had large-scale layoffs last year. "The decline in layoffs suggests many businesses have completed this exercise and it could be read as a sign that companies will start hiring more actively again later this year," he said. Even if job growth slows, the labour market will remain tight. Surveys show that business expectations and hiring intentions have improved for manufacturing and services firms, said OCBC economist Selena Ling.